If you have served in the armed forces you may be eligible for veterans' benefits. Please note that the different branches of the military offer different types of aid and require different types of commitments. At Purdue, the Veterans Success Center certifies enrollment for veterans' benefits. The Division of Financial Aid can advise you on your eligibility and the process for pursuing financial aid for veterans. In addition, part-time military service may be available in the National Guard, and in the Army, Navy, Marine, and Air Force reserves. In exchange for service on weekends and a couple of weeks during the summer, students can receive tuition benefits, repayment of portions of their federal student loans, and full-time employment during school breaks. This is in addition to pay received for part-time service. The Post-9/11 GI Bill provides financial support for education and housing to individuals with at least 90 days of aggregate service on or after September 11, 2001, or individuals discharged with a service-connected disability after 30 days. The Post-9/11 GI Bill includes graduate degree programs offered by an approved institution of higher learning. It will pay your tuition up to the highest in-state tuition charged by a public educational institution in the state where your school is located. The amount of support you qualify for depends on where you live and the type of degree you are pursuing. 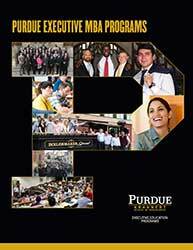 Purdue's Executive MBA and IMM Global EMBA programs have the same tuition rate for in-state and out-of-state students, so the Post-9/11 GI Bill may cover up to 100% of the program tuition. You are responsible for completing all necessary steps as directed by the U.S. Department of Veterans Affairs in securing financial support via your GI Bill benefits. Please contact the VA directly or reach out to Teresa Harris, Veteran Affairs Certifying Official with Purdue’s Veterans Success Center, at 765-494-1511 or harri262@purdue.edu.